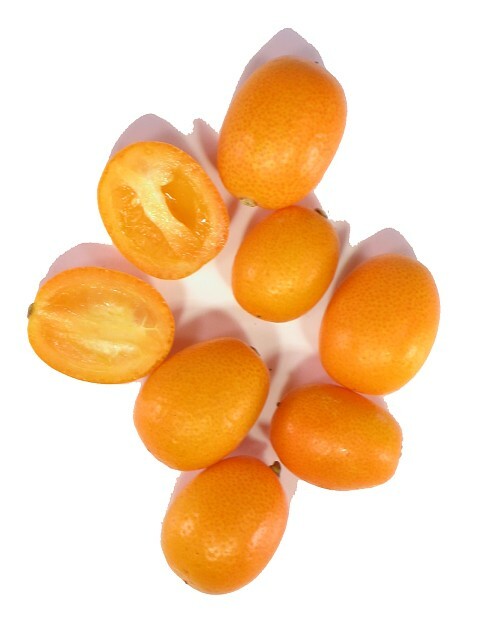 Kumquats have been called "the little gems of the citrus family". They were included in the genus Citrus until about 1915 when Dr. Walter T. Swingle set them apart in the genus Fortunella, which embraces six Asiatic species. The common name, which has been spelled cumquat, or comquot, means "gold orange" in China. The kumquat is an entirely edible citrus fruit. The skin is often sweet and the meat is tangy and tart. Kumquats can be candied, kabobed with other fruits or meats, such as lamb or pork. A superb garnish for entrees and drinks. Fresh kumquats, especially the 'Meiwa', can be eaten raw, whole. For preserving, they should be left until they lose some of their moisture and acquire richer flavor. The fruits are easily preserved whole in sugar sirup. Canned kumquats are exported from Taiwan and often served as dessert in Chinese restaurants. For candying, the fruits are soaked in hot water with baking soda, next day cut open and cooked briefly each day for 3 days in heavy sirup, then dried and sugared. Kumquats are excellent for making marmalade, either alone or half-and-half with calamondins. The fruit may be pickled by merely packing in jars of water, vinegar, and salt, partially sealing for 4 to 5 days, changing the brine, sealing and letting stand for 6 to 8 weeks. To make sweet pickles, halved fruits are boiled until tender, drained, boiled again in a mixture of corn sirup, vinegar, water and sugar, with added cloves and cinnamon, and then baked until the product is thick and transparent. Kumquat sauce is made by cooking chopped, seeded fruits with honey, orange juice, salt and butter.